Chris Bagby, owner of Highland Woodworking, flew from Atlanta to Cedar Rapids, Iowa last weekend to attend the first ever Handworks, a woodworking show that was all about hand tools. Below is his description of the event, and here is a link to an interesting photo tour of the Handworks show. For what seemed like was going to be a fairly small event, the crowd waiting outside the Amana Colony’s “Festhalle” barn was quite large and enthusiastic. And here we were out in the middle of nowhere, so to speak, on a Memorial Day weekend. The event was organized by the owners of Benchcrafted, a specialty manufacturer of fine workbench vises. Jameel Abraham is the technical wizard of the operation, and his brother Father John Abraham leads the business end of the enterprise. The event’s venue was a very large old barn. Large as barns go, but not all that large by woodworking show standards. The crowd quickly filled the aisles between 3 rows of vendors and it became a challenge just to turn sideways. Demonstrations were underway at every exhibitor stand. The Lie-Nielsen Toolworks exhibit occupied all the space on an elevated stage on one end of the barn. Lee Valley and Veritas anchored the other end of the barn. Between were a couple dozen exhibits staffed mostly by, well, woodworkers who had turned their interest to tool making. Also on hand was the Lost Art Press, who unveiled their newest book title, By Hand and Eye, written by Geo. R. Walker and Jim Tolpin. For 2 days I made the rounds, getting reacquainted with several vendors with whom Highland Woodworking has been doing business over the years, as well as meeting quite a few new people whom I’d not met before. Among them were a number of Highland customers who all seemed to have pleasant stories to tell about shopping with us online or otherwise over the years. And there were several vendors whose wares I am very interested in and hope to add to our product line soon. I also enjoyed meeting Joel Moskowitz, owner of Tools for Working Wood in New York, another competitor of ours. Joel manufactures the Gramercy line of woodworking tools. Although I tried, I was not able to talk him into selling me a hundred of his unique bench holdfasts for us to sell. On Saturday morning a standing-room-only crowd watched and listened as Chris Schwarz and Don Williams presented an excellent slideshow about the extraordinary tool chest of Henry O. Studley, an organ and piano maker who lived from 1838-1925. Both the chest itself and the array of tools it contains are spellbinding. The chest is made of mahogany, rosewood, walnut, ebony, and mother of pearl. Tools and chest together are reckoned to be worth “in the low 7 figures.” Lost Art Press will be publishing a book about the chest in the near future. 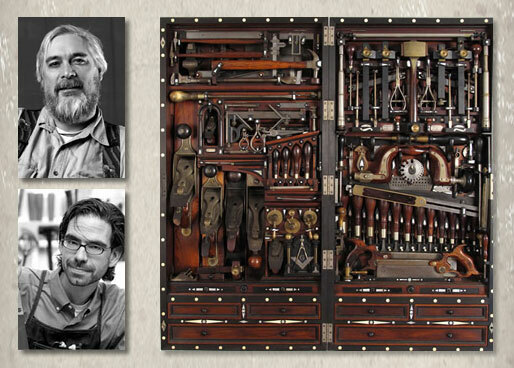 By the way we sell a poster depicting the tool chest at the Highland Woodworking website. 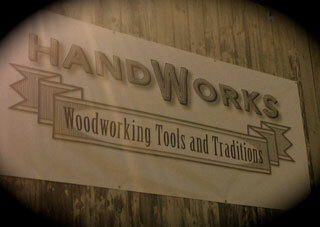 It’s not known whether Handworks will become an annual event. Someone said they plan to repeat every two years, which seems to me like a good plan. I’m not sure the old barn will hold all the attendance that’s likely to show up in 2015 though. This was truly a unique event, far more down-to-earth than any other woodworking show I’ve ever attended. I was there – I’m in the picture, but from the back. Absolutely stupendous event. I was there – I can prove it – I’m in the picture, but only showing my backside. Chris, thank you sharing your comments on the show. I was there on Saturday and had I known your were going to be there you could have brought my woodslicer with you. It must have followed you up to IA. I sure hope that they continue to have this show, as it was so very interesting to attend. Unable to go this year. If they do have have it again in 2 years then a trip to Iowa for me. Thanks for the write up on this wonderful event. What a fascinating show. One I definitely need to attend! And thank you Chris and Highland Woodworking for doing such a diligent job in reporting about our industry. I find the e-newsletter, Highland Website, and in-store experts to be the best resource for woodworking information in the market. From a beginner making birdhouses to a master doing marquetry, Highland continues to have our imagination captivated. You guys do a great job! Your coverage of this Iowa Event, was especially significantly for me, although I’m been your customer since you and Sharon were both at the cash register, (across the street). My daughter (Jennifer) and your daughter (Kelley) used to play ‘hide and seek’ among your isles and shelves, over across the street, while I knew that you were putting together an assembly of mdse. that I apperciated. You have NEVER lost your ‘touch’ of tradition,,, and there the BACKBONE …. Wow. Hand tool enthusiast. We have a large group of them here in the North Georgia area that participate in the Society of American Period Furniture Makers meetings. Most of our members are avid hand tool users, owning some of those represented at this show.